The model is protected with an armoured plate and shut-off plates. 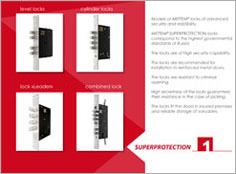 The model locks a door with six steel locking bars 16 mm in diameter which move forward 38,5 and 24 mm. One of the locking bars contains a core made of hardened steel which prevents from sawing.